Your background is great--I can see grass, but also abstract. The animals are precious!!!!!!!!!!!!!!!! Adorable new set, adorable card. Those mice are my favorite; so sweeeet! Awww!!! Your card is so cute!!! Love it!!! 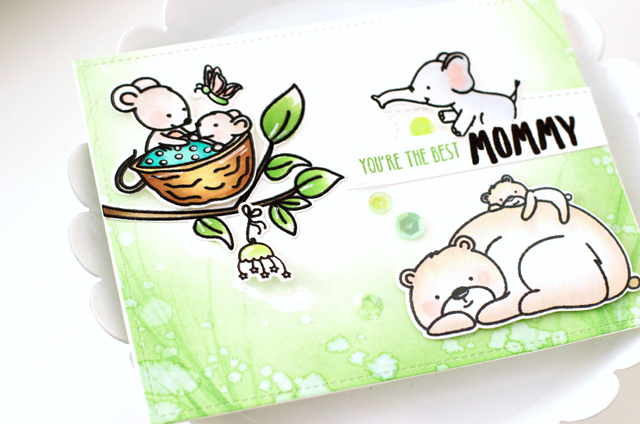 Such a sweet and pretty card - love all the critters and the soft green background. Such a sweet card incorporating all the cute critters! All these critters are just soooo adorable !! Love how your card includes all of the cute animals. Love how you incorporated all these critters in the card! So cute!! All these little guys are just too adorable!